Tri Arc Ladders, 888-661-0845, Call a PRO! 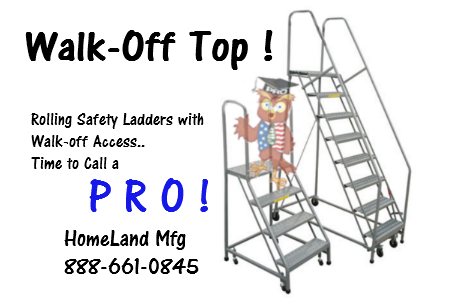 Tri-Arc Rolling Safety Ladders offer a superior weight rating and paint finish. 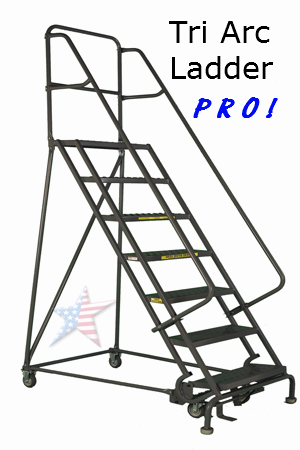 These TRI-ARC Rolling Safety Ladders have a beefy 450 pound load rating and a powder coat paint finish. Heavier weight Rating on a Rolling Ladder capacity is important if the user may be carrying a small load or doing maintenance work. Powder coat Paint gives the platforms a resilient finish against paint chipping. Meets OSHA 1910.29 & ANSI A14.